Dry needling is a technique for the treatment of pain and movement impairments. The technique uses a “dry” needle, one without medication or injection, inserted through the skin into areas of the muscle. Other terms commonly used to describe the procedure include trigger point dry needling and intramuscular manual therapy. It’s a common misconception, but dry needling is not acupuncture – a practice based on traditional Chinese medicine and performed by acupuncturists. Instead, the procedure is a part of modern Western medicine principles, and it is supported by research. If It Isn’t Acupuncture, Then What Is It? 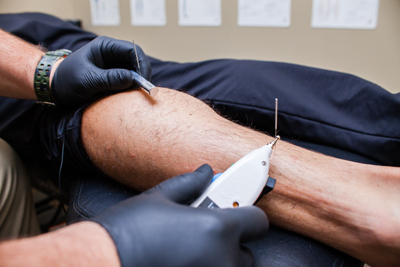 Dry needling involves a thin filiform needle that penetrates the skin and stimulates underlying myofascial trigger points and muscular and connective tissues. The needle allows a the doctor to target tissues that are not manually palpable. A trigger point is a taut band of skeletal muscle located within a larger muscle group. Trigger points can be tender to the touch, and touching a trigger point may cause pain to other parts of the body. The goal of treatment is to release or render inactive those trigger points. Pain relief and improved range of motion should follow. Preliminary research supports conclusions that dry needling improves pain control and reduces muscle tension. Further, it normalizes dysfunctions of the motor end plates, the sites at which nerve impulses are transmitted to muscles. This can help speed up the patient’s return to active rehabilitation. Some experience pain in this procedure, but most often, that pain is far less than the pain a patient is already experiencing. For many, it just “hurts so good” – bringing much needed relief to symptoms that have often lasted for years. Want to find out more? Or, are you curious if this procedure is an option for your treatment? Reach out and find out more.